Caffeine serves a variety of functions and is found naturally in beverages, such as coffee, tea and chocolate, as well as an additive to headache medications or cola drinks. The Coffee Science Information Centre notes that caffeine is the most widely consumed pharmacologically active substance in the world, meaning it serves as a drug that activates the central nervous system, causing temporary stimulating effects. For most, the benefits of caffeine supersede the consequences. However, moderation in use is key to prevent functional disturbances such as sleep problems, irritability and nervousness. Excessive use of caffeine in the daytime has similar effects to caffeine use at night in regards to increasing alertness. Staying alert is often important for individuals on night shifts or in jobs that require night driving. A 2006 research study in the "Annals of Internal Medicine" concluded that study subjects using caffeine at night for improved driving, resulted in adequate driver performance compared to individuals experiencing fatigue and no caffeine use while driving. However, the level of alertness and duration of performance varied per individual and dosage of caffeine consumed. Although caffeine consumption can temporarily increase alertness at night, it does not cause sobriety in those intoxicated with alcohol. Insomnia is a side effect of drinking late night caffeinated beverages, especially if more than 500 milligrams is consumed in a 24 hour period. 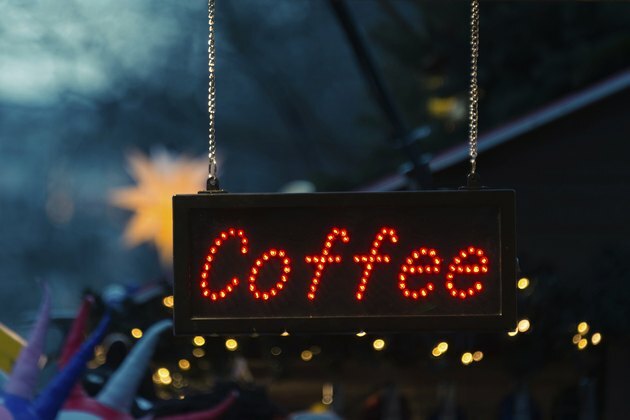 Drinking a caffeinated beverage prior to bedtime will delay sleep onset, as well as alter the normal stages of sleep achieved during the night, according to Johns Hopkins Bayview Medical Center. A 1974 study reported in the "British Journal of Clinical Pharmacology" explored sleep disturbance in middle-aged adults after administering 300 milligrams of caffeine at night. Study participants showed increased wakefulness and once sleep occurred, subjects were unable to reach adequate deep sleep stages. Ongoing sleep studies continue to report that caffeine sleep disturbance is dependent upon individual sensitivity and tolerance to the substance, dose and frequency of use. Use of caffeine at night can result in difficulties staying awake during the daytime and hinder cognitive functions. The American Academy of Sleep Medicine indicates that a 2009 study published in "Pediatrics" concluded, adolescents using caffeine through the night tended to suffer from tiredness at school, decreased participation in class and slowed thinking. In addition to lethargy during the day, irritability and mood disturbance can occur from lack of sufficient and deep sleep. The potential for experiencing caffeine withdrawal the next day after late night use results in side effects such as headaches, poor concentration and anxiety. Developing withdrawal side effects is dependent on the individual. However, the Johns Hopkins Bayview Medical Center website explains that withdrawal can occur from as little as 30 milligrams of caffeine. Minimal day time use of caffeine and avoidance of night caffeine consumption is suggested to prevent withdrawal effects.